My mantra is simple: Don’t stop believin’! For more than five decades Olivia Newton-John has been one of our most successful and adored entertainers. A four-time Grammy Award winner, she is one of the world’s best-selling recording artists of all time, with more than 100 million albums sold. 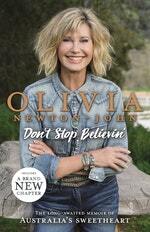 Her starring roles in the iconic movies Grease and Xanadu catapulted her into super stardom. Her appeal as a performer is timeless. 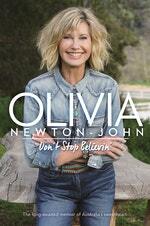 Now she is sharing her journey, from Melbourne schoolgirl to international superstar, in this deeply personal book. 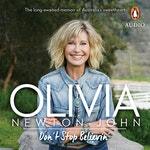 Warm, candid and moving, Don’t Stop Believin’ is Olivia Newton-John’s story in her own words for the very first time. Bad days will hurry by. My favourite time of day is ‘magic hour’, when the sun takes a dive behind the craggy mountain ranges and the sky is painted a stunning purple-pink. I’m sitting there right now on a weathered stone bench allowing the day to wash over me, surrounding myself with love and light. I smell the early summer roses and smile as our energetic German shepherd, Raven, brings me her ball for yet another toss. My wonderful husband John should be pulling up in the driveway any moment. It’s a beautiful life and remains so, even though I told the world a few hours ago that my cancer had returned. Yesterday I went in to be measured. When you have photon radiation therapy, you must be in exactly the same position every single time, so they give you small dot tattoos to make sure your body is lined up properly in the machine. Five early career turning-points revealed in Olivia Newton-John’s Don’t Stop Believin’. Love Don't Stop Believin'? Subscribe to Read More to find out about similar books.